Japan has continued to ratchet up pressure on South Korea on Tuesday over a ruling that ordered a Japanese company to compensate South Korean victims forced to work during Japan’s colonial rule of the Korean Peninsula. South Korea is trying to find a way to “respect” the judiciary’s decision while mitigating the diplomatic fallout with Japan, despite little room for diplomatic maneuver due to the legally binding nature of the top court’s ruling. The Supreme Court last week ruled that Nippon Steel & Sumitomo Metal must pay 100 million won ($88,000) each to the plaintiffs, who were forced to work at its steel mills between 1941 and 1943 during Japan’s occupation of the peninsula. Japanese officials deny the forcible nature of its use of South Korean workers during the colonial era and pressuring South Korea to compensate the victims instead, though analysts say there is not much Tokyo can legally do about the ruling other than swaying public sentiment. Japan has decided to unilaterally take the case to the International Court of Justice without South Korea’s consent, Japanese right-wing newspaper the Sankei Shimbun claimed Tuesday, though this has not been confirmed by the government in Tokyo. Japan is also considering filing a complaint against South Korea with the World Trade Organization over the government’s subsidies for Daewoo Shipbuilding & Marine Engineering, according to Japanese media. Some speculate that the move is intended as retaliation against South Korea over the ruling on forced labor. On Monday, a group of Japanese lawmakers, including Yasuhisa Shiozaki, met opposition lawmakers and denounced the ruling as unacceptable. He said the ruling overturned the legal basis of the relationship between South Korea and Japan during his meeting with Rep. Kim Byung-joon, interim chief of the main-opposition Liberty Korea Party, according to a local news report. 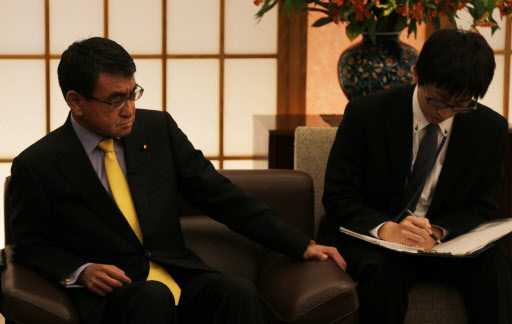 In an interview with Bloomberg on Sunday, Japan’s Foreign Minister Taro Kono reiterated that the ruling posed a serious challenge to South Korea-Japan relations and that the issue had been settled under a 1965 South Korea-Japan treaty. Under the treaty that settled colonial-era issues, South Korea restored its diplomatic relations with Tokyo in return for a reparations package of $500 million in grants and low-interest loans that contributed to Seoul’s economic takeoff. South Korea should deal with the issue before bilateral ties can move forward, he added. South Korea is working to create a body comprising government officials and outside experts under Prime Minister Lee Nak-yon’s office to draw up follow-up measures. It has pursued a two-track strategy of separating historical issues from security and economic issues to develop “future-oriented” relations with Japan. “We are closely coordinating with Japan and are preparing (to hold official consultations with Japan,)” said Kim Deuk-hwan, deputy spokesperson at Seoul’s Foreign Ministry, at a regular briefing Tuesday. Despite Japan’s sharpening rhetoric against South Korea, Japan does not have legal options to confront South Korea about what it claims is a violation of the international law. “Japan is making such gestures to pressure South Korea to react. But Japan has no legal procedures to raise a complaint about the ruling,” said Lee Ki-beom, research fellow at the Asan Institute for Policy Studies. Japan might aim to damage South Korea’s credibility by appealing to the international court, but Lee said that it was not legally possible without South Korea’s consent. “Also, the government has no legal obligation to offer an explanation on why it is not accepting Japan’s request for taking the case to the International Court of Justice,” he said.